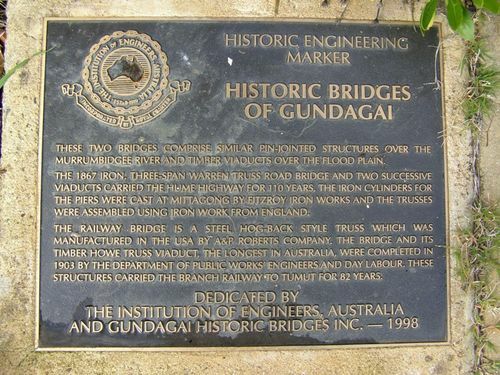 An Historic Engineering Plaque commemorates the bridges of Gundagai. 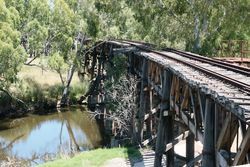 THESE TWO BRIDGES COMPRISE SIMILAR PIN-JOINTED STRUCTURES OVER THE MURRUMBIDGEE RIVER AND TIMBER VIADUCTS OVER THE FLOOD PLAIN. 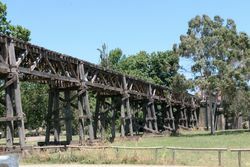 THE 1867 IRON, THREE-SPAN WARREN TRUSS ROAD BRIDGE AND TWO SUCCESSIVE VIADUCTS CARRIED THE HUME HIGHWAY FOR 110 YEARS. 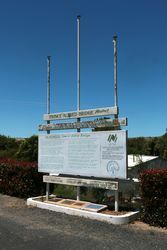 THE IRON CYLINDERS FOR THE PIERS WERE CAST IN MITTAGONG BY FITZROY IRON WORKS AND TRUSSES WERE ASSEMBLED USING IRON WORK FROM ENGLAND. 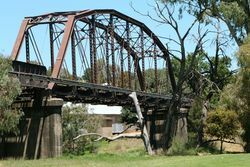 THE RAILWAY BRIDGE IS A STEEL HOG-BACK STYLE TRUSS WHICH WAS MANUFACTURED IN THE USA BY A&P ROBERTS COMPANY, THE BRIDGE AND ITS TIMBER HOWE TRUSS VIADUCT, THE LONGEST IN AUSTRALIA , WERE COMPLETED IN 1903 BY THE DEPARTMENT OF PUBLIC WORKS ENGINEERS AND DAY LABOUR. 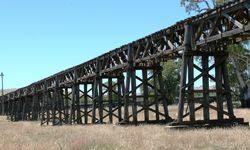 THESE STRUCTURES CARRIED THE BRANCH RAILWAY TO TUMUT FOR 82 YEARS.